This past summer we bought our kids a slackline. If you are not familiar with it think tight rope only a little wider and with slack or bounce. We strung the line between two trees 25 feet apart about 2 feet off the ground and we all attempted to walk across it. It’s really difficult! 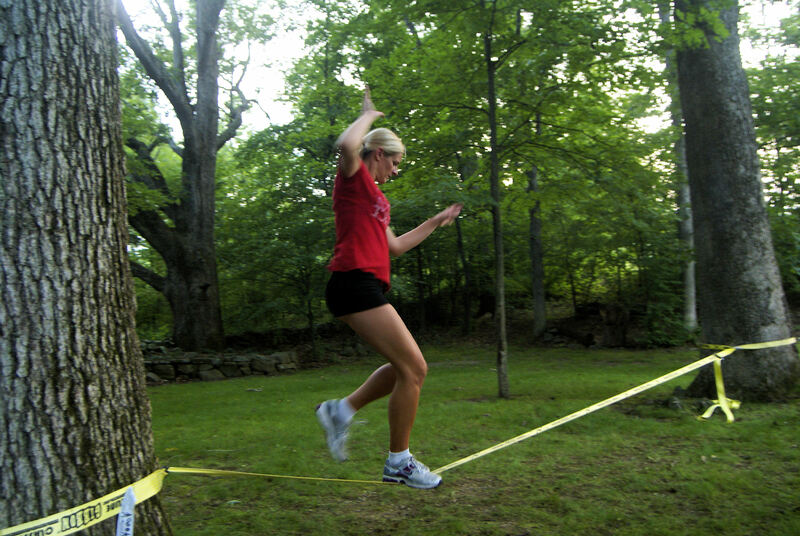 As soon as you put a foot on the slackline, the whole thing starts shaking and bouncing up and down. For us, making it half way across was a huge accomplishment. It takes a lot of concentration and core strength. Last year my two older children also took climbing lessons at a local indoor rock gym. 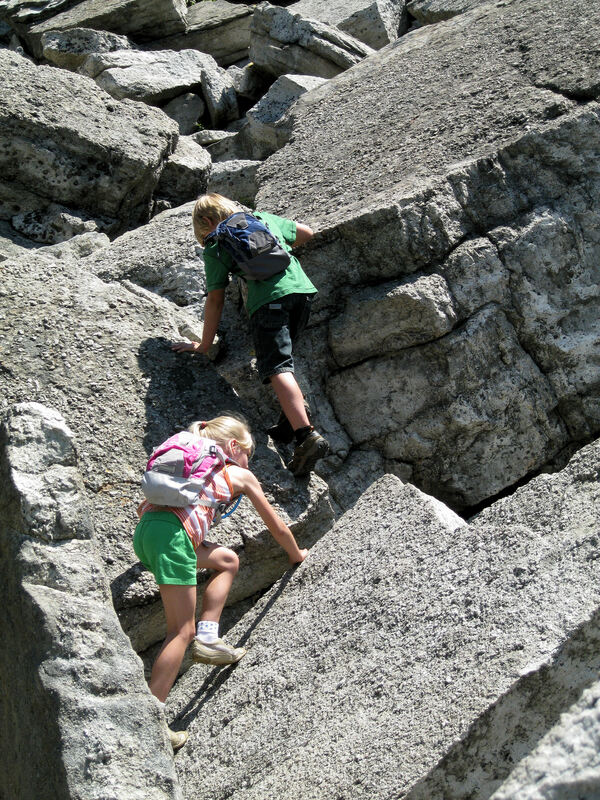 There they learned proper climbing techniques and were able to practice on increasingly difficult climbing routes. They absolutely loved it and really want to take lessons on real rock faces. I am really proud of these accomplishments. I tend to push my kids to move beyond their comfort zone physically in order to allow them to see how much they really can do. It’s amazing what they can do and the sense of accomplishment is great to see. 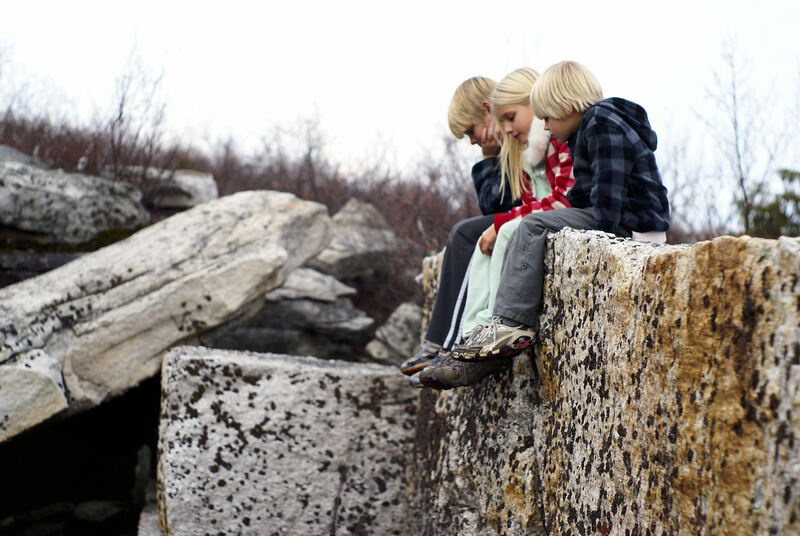 They will climb anything- trees, boulders, cliffs, ladders, all without fear. I might be crazy, but while I would never ever want any serious injuries to happen to my kids, I feel a few bumps and bruises are a good thing because they help alleviate fear and produce stronger, more secure kids. But my question is where will this lead and should I worry? Where is that line? We watched a video the other day about a guy who started out rock climbing and is now into free climbing which is climbing without the aid of ropes, crossing a slackline between two cliffs again without any harness, and BASE jumping with a wingsuit! Is this where I want them to end up? No, of course not! But, I really want my children to be fearless and willing to try anything and accomplish that thing. I want them to realize that they can do so much more than they think they can if they push themselves and practice. The question again is, where there is that line? It’s different for every person, different for every mom! Where is it and do I really have control over it in the end? Another example of “the line” is kids sports and extracurricular activities. I have had numerous conversations about this lately. Just how many activities do you get your young children involved in and are they really necessary? Does my 1st grader need to be on the travel soccer team to ensure that he will be able to play on the high school team or is this just a recipe for burnout by 4th grade? Is it my dream as a parent or truly what my child wants? This applies to any activity. Music, art, extra education, it doesn’t matter what the activity is, the question is, is it really necessary? My immediate reaction to that is no, not necessary. But, as I think about it I realize that that reaction may be because I am not passionate about soccer, for example. The activities that I am passionate about are not team focused or school and town sponsored. So, before I look down at those who are involved, I realize that I do push my kids in the activities that I feel are important; hiking, skiing, and running to name a few. I also push them by the sheer busyness of our lives because that is what I love, constant activity! Preparing for life or crazy American non-stop competitiveness, which is it? Really, I have no answer to this one.